Surrounded by greenery for adults and children, a few minutes from the Cinque Terre and the beaches of Lerici, Forte dei Marmi, Marina di Massa and Viareggio. VERY NEAR THE SEA, just minutes from the Cinque Terre and the beaches of Lerici, Forte dei Marmi, Marina di Massa and Viareggio. In both cases at the end of this road turn right into Via San Gottardo, past a small petrol station take the first turn left (via Turi). After about 1 Km on Via Turi, on the right, you will notice small bridges, proceed to number 120. You have arrived. 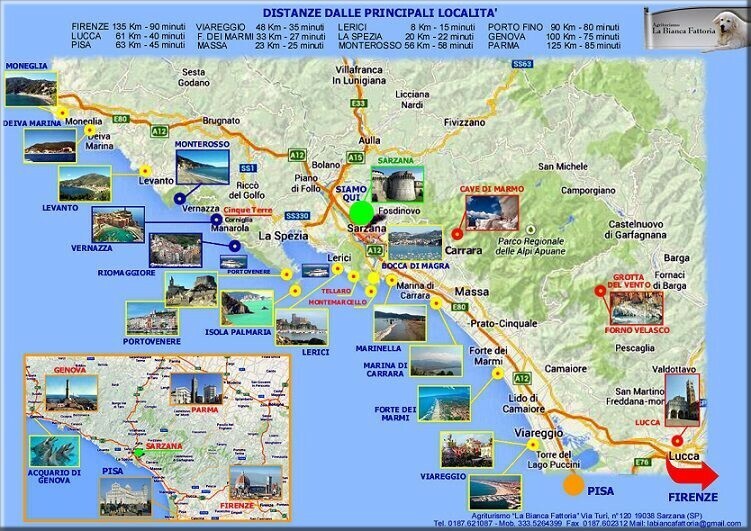 Tourist resorts nearby convenient to reach: Lerici, Cinque Terre (Monterosso, Vernazza, Corniglia, Manarola, Riomaggiore), Versilia (Pietrasanta, Forte dei Marmi, Seravezza, Stazzema, Camaiore, Viareggio), Massa, Carrara and the marble quarries. Easily reachable in: Car, Train from Sarzana, Bus from Sarzana, Ferry. Cities to visit: Genoa, Pisa, Lucca, Florence.